MADE FROM SCRATCH with local meats, dairy and fresh produce (whenever possible) using recipes passed down through the generations. Sound like your kind of food? The Amboy Cottage Cafe, snugged into the corner opposite the old grain elevator along Amboy’s Maine Street. This past summer, my husband and I lunched at The Amboy Cottage Cafe, a charming 1928 cottage style former gas station turned eatery tucked into a corner of Maine Street (and, yes, it’s Maine) in the farming community of Amboy. 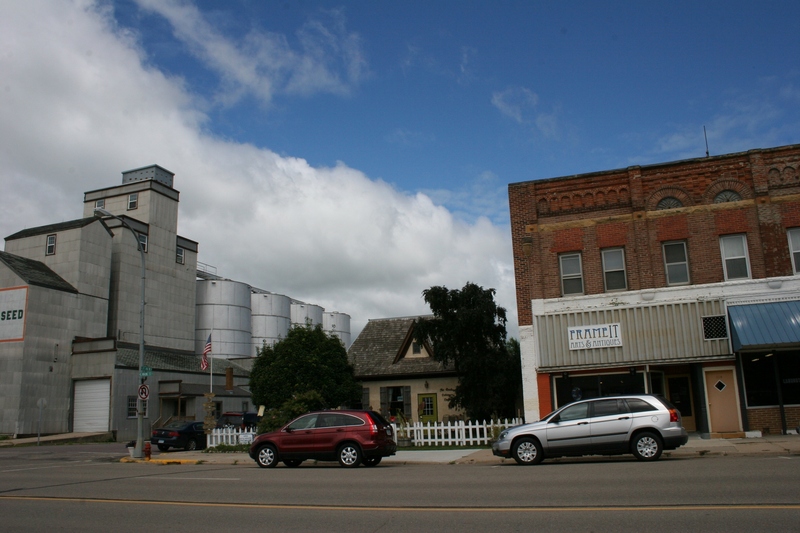 A snippet photo of downtown Amboy, Minnesota. I love this place as much for its uniqueness and ambiance as for the food. 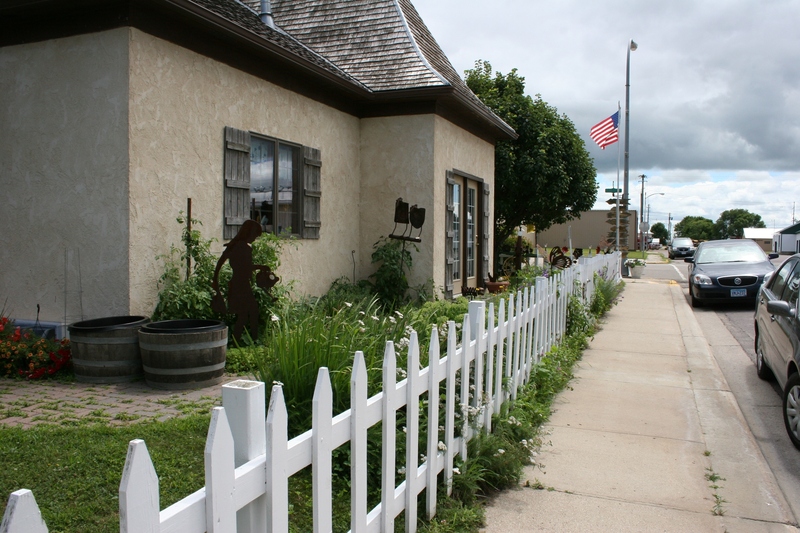 Opened 13 years ago by Lisa Lindberg in this town of some 535 in Blue Earth County in rural southern Minnesota, this cafe is definitely worth the drive. 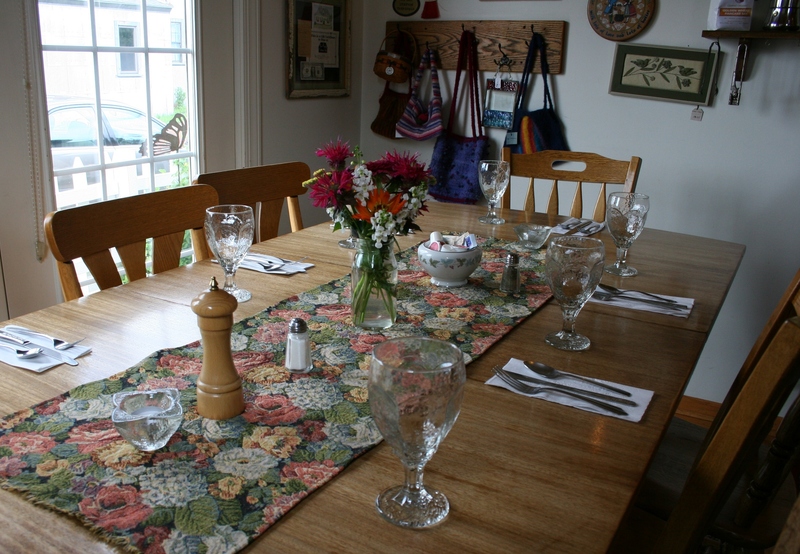 Lunch at The Amboy Cottage Cafe with tables for two and tables for many. On the other end of the cafe, more diners enjoy lunch on a July afternoon. At lunch time on a Friday in late July, the place was packed. We invited a couple from Mankato, 20 miles distant, to sit at our table so they would have a spot to dine. Diners feel right at home in a cafe that features a variety of table styles, mismatched china and fresh garden flowers (during the summer months). 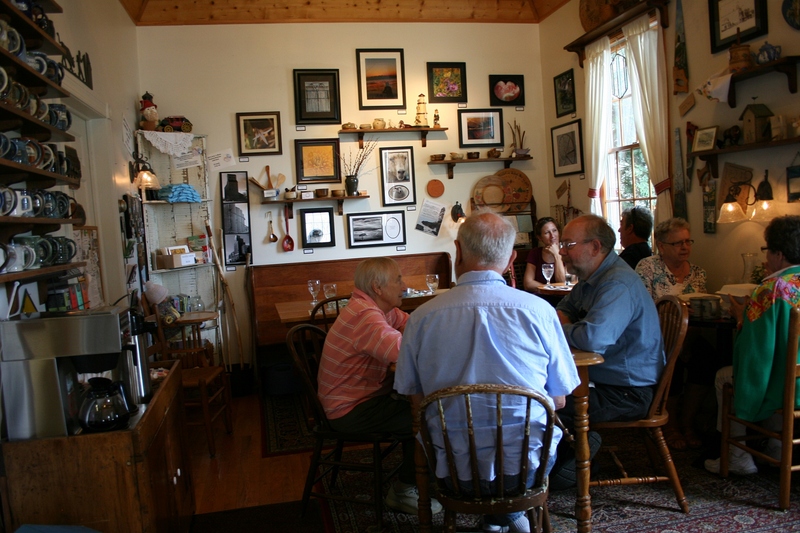 The Cottage Cafe possesses that neighborly kind of intimate feel in a space that’s family dining room/kitchen cozy. Come here for breakfast and you can order a “For the Farmer in You” plate of two eggs (any style and these are locally-produced eggs), three slices of smoked bacon, multi-grain toast with pancake or hash browns, and orange slices. 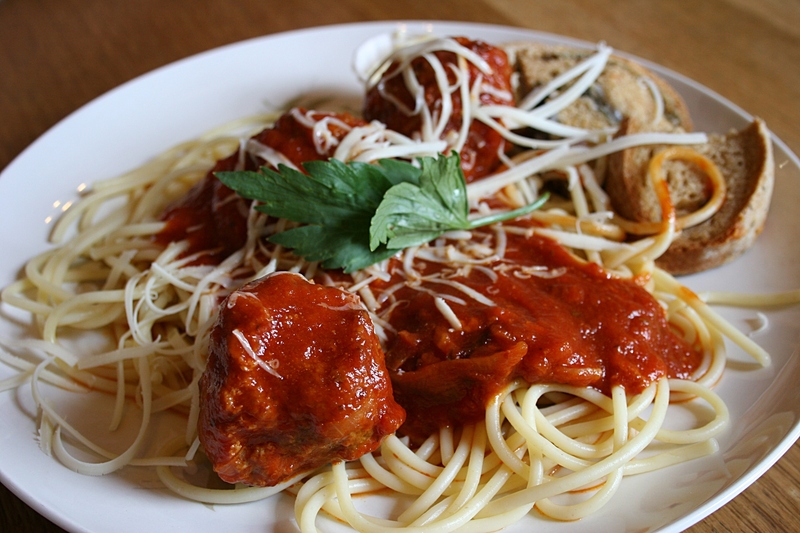 Spaghetti with homemade meatballs and sauce. My incredible raspberry chicken salad. On this day, my husband ordered a platter of spaghetti and meatballs while I chose the raspberry chicken salad. We both rated our food as outstanding. We couldn’t pass on the homemade blackberry pie. With an approach of using fresh local ingredients, whole grains and lots of fresh fruits and vegetables, this cafe offers an array of healthy foods, although you will find sweet treats like caramel rolls, pie and raspberry bread pudding among the offerings. Be assured, though, that you’ll sink your teeth into homemade breads and a pie crust made from Grandma Maria’s recipe. I’ll vouch for the pie as Randy and I shared one incredible slice of blackberry pie. Plenty of healthy options on the menu. From seasoned coffee-rubbed steak, wild Alaska salmon and olive chicken to burgers, sandwiches, soups, salads, specials and more, you’re sure to find something on the menu that pleases your palate. I had a tough time choosing from the enticing made “from scratch—like your grandmother” selections. Don’t expect to order fries cooked in a deep fat fryer. The cafe doesn’t own a fryer and uses real butter and canola and olive oils in cooking. See what I mean about this place? How many kitchen restaurants ban deep fat fryers? The day’s specials and other offerings noted on a menu board. That all said, I’m neither a health nut nor a foodie. But I try to eat healthy and I know good food, really good food, when I taste it. 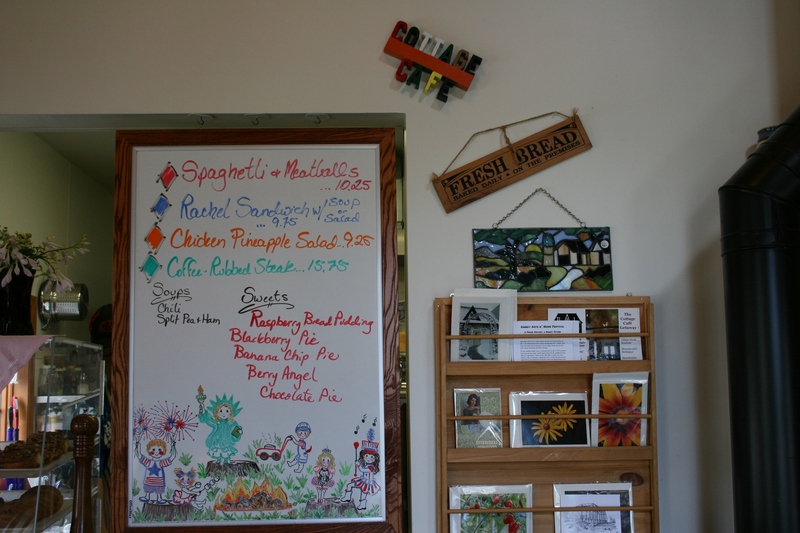 And I tasted it—really good food—at The Amboy Cottage Cafe. 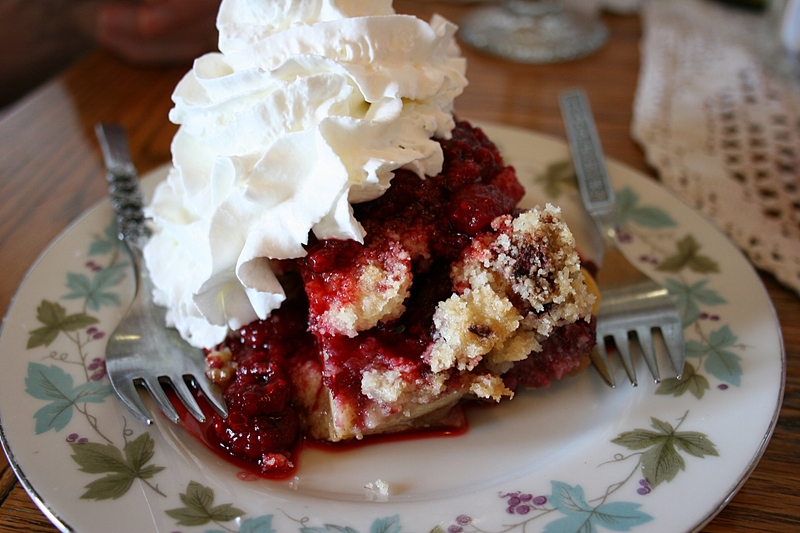 Another couple dining at the cafe graciously allowed me to photograph their raspberry bread pudding. 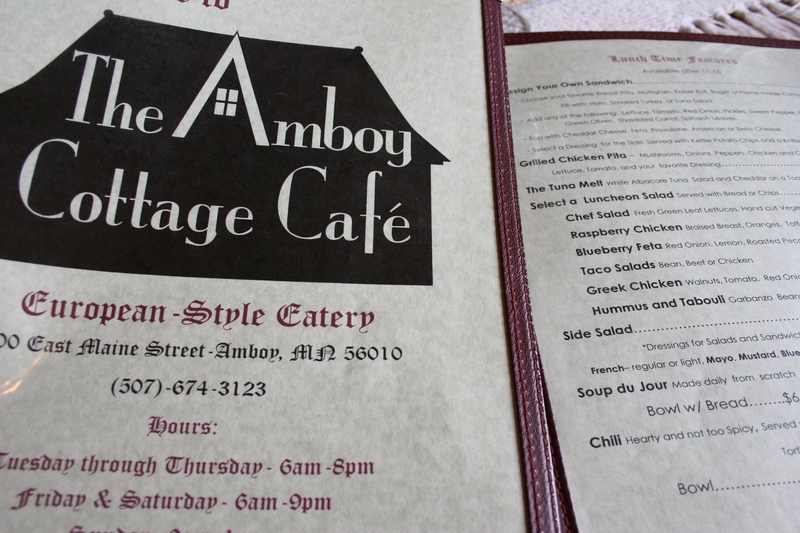 FYI: The Amboy Cottage Cafe is currently celebrating its 13th anniversary and is offering a free piece of caramel apple or raspberry bread pudding to diners this weekend. I would expect the place to be packed. You may want to call ahead (507-674-3123) for reservations if you’re driving from any distance. And I’d suggest that anytime, not just this weekend. My husband, Randy, exits The Amboy Cottage Cafe on a Friday afternoon in July. Winter cafe hours are from 9 a.m. – 1 p.m. Sundays, from 6 a.m. – 3 p.m. Tuesday and Wednesday, 6 a.m. – 8 p.m. Thursday, and from 6 a.m. – 9 p.m. Friday and Saturday. The cafe is open on Mondays only during the summer. Click here to reach the cafe website, and here to reach the Facebook page. 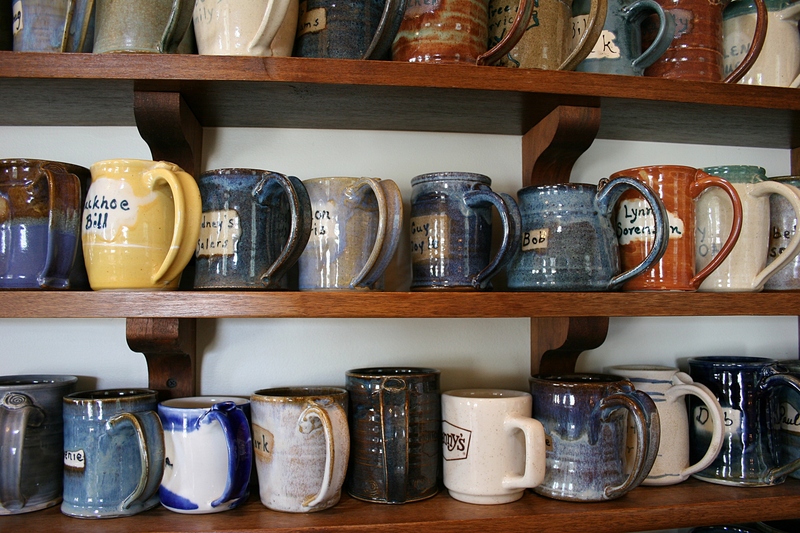 Purchase a personalized homemade mug for $100 and you get free coffee every time you visit the cafe. 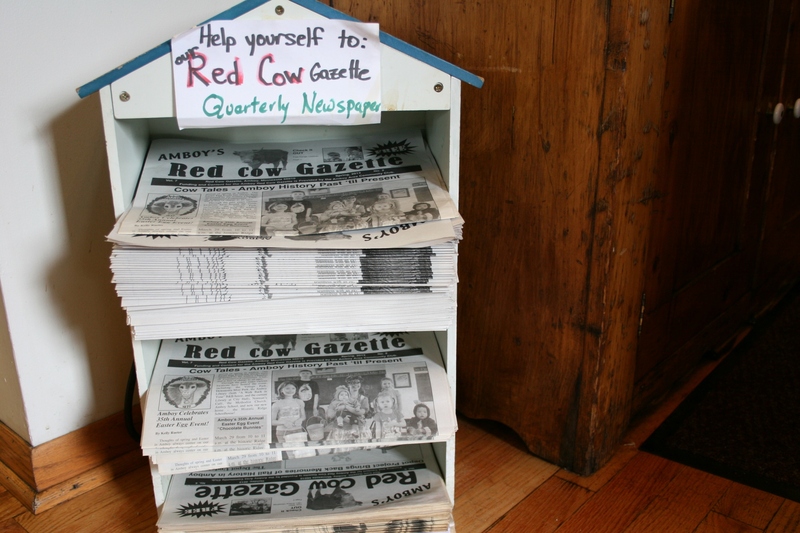 Catch up on the latest in Amboy via the quarterly Red Cow Gazette, funded by the Amboy Area Community Club. Loved our waitress’ red tennies. Flowers and garden art define the exterior. 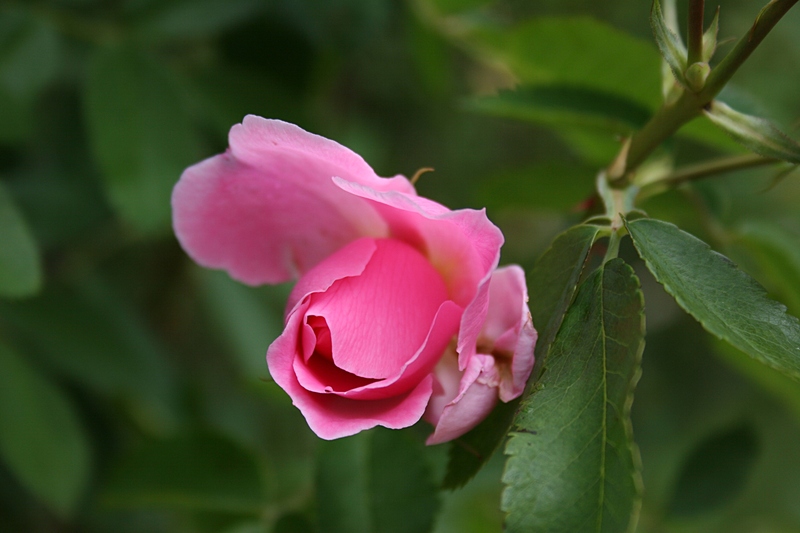 I took time to smell, and photograph, the roses outside of the cafe. 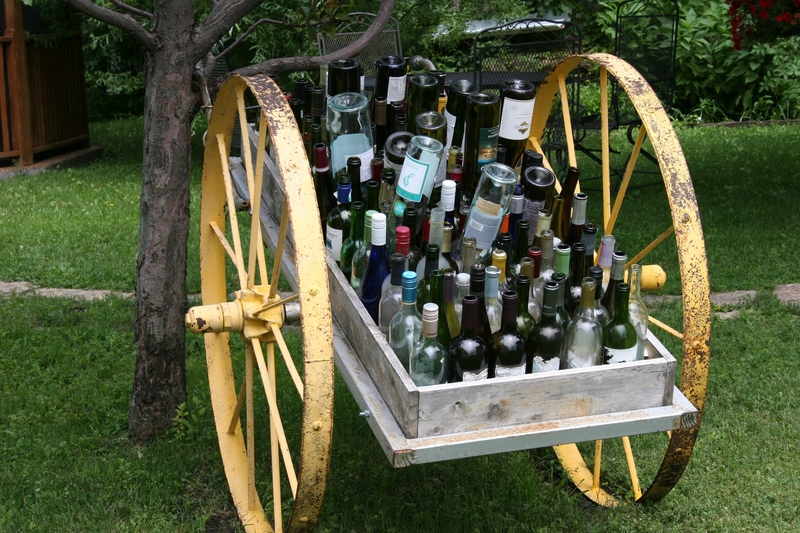 I spotted this bottle art behind the cafe. Evening diners can bring in their favorite alcoholic beverage to have with a meal. There is no corking fee. A final parting shot showcases the white picket fence surrounding this former gas station now turned European style eatery. © Copyright 2014 Audrey Kletscher Helbling. All photos were taken when we dined at the cafe in July 2013. Watch for more photos from Amboy, a community with a strong arts presence and more. I think I MUST go there! That pie looked so yummy and the quaint atmosphere is just my cup of tea. It looks like a really wonderful place where you could meet some really interesting locals and visitors. 🙂 Thanks for another lovely view of small town America. If we would have had more time, I would have chatted it up with the locals. A return trip to Amboy is in order. Lots of interesting little shops and more in this community. We basically had time to pop in and out of a few after lunch. 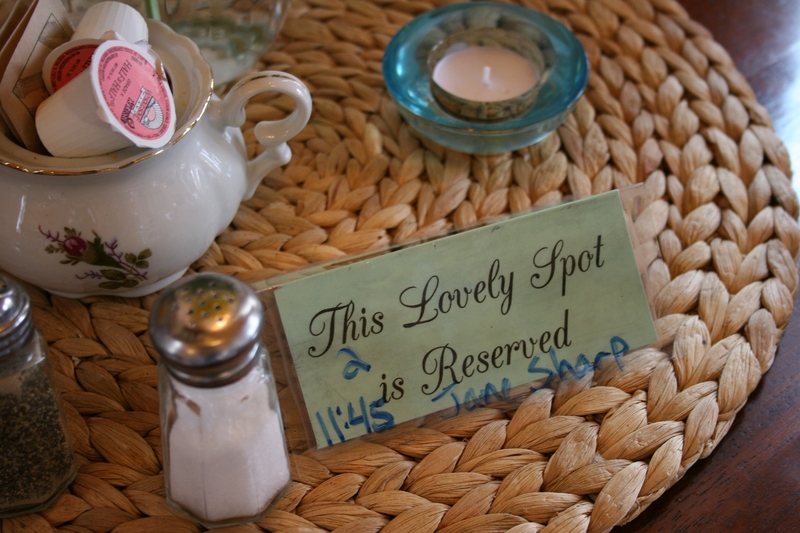 And, yes, you can order tea at The Amboy Cottage Cafe. I like everything about this cafe, the home made food, the way it’s set up, the exterior, the mugs, table setting, white picket fence… who wouldn’t want to visit this sweet little place. I Love how you and Randy invited that couple to sit with you, they were probably very appreciative of a place to sit, and what better company than you two. Thanks, Sue. Yes, you would love this cafe, especially given your appreciation of good food. Uh, no, I haven’t forwarded the blog posting. Wow!!! Just visited their site and Fb. Yum!! I’m really hungry now! Looks like a great motorcycle destination for us next summer!!!! Thanks so much for the info!!!!! There you go. Start that summer bike destination list. DH thought it looked great!!!!! List begun…………. Great, the DH Seal of Approval. Lisa Lindberg actually saved this old gas station from demolition, had it moved onto the current site and then had the building restored. Oh, Charlie, you would have loved that blackberry pie. So, so good. It is. No cookie cutter chain restaurant here. What a Charming Place – LOVE Your Captures:) I love eating at places like this and supporting local business owners too. Happy Week! I am with you in not being a fan of chain restaurants. We usually look for charming places to eat when traveling – makes me feel at home. Exactly. I prefer the one-of-a-kind dining experience in both food and atmosphere. LOVE those mugs! How awesome is that! What a great idea for a local place. Makes everyone feel at home. And that food looked fabulous! 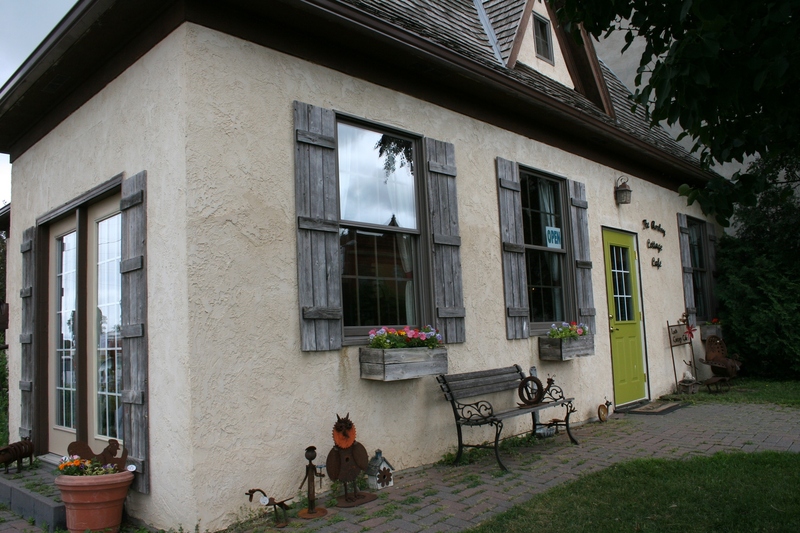 You would love The Amboy Cottage Cafe. Maybe a stop for you sometime when you’re heading up to Mankato. It’s one of our favorite places ! We’ve had breakfast,lunch and dinner there….and have even stopped in for just the pie and coffee. We especially like the fact that she uses as many local ingredients as she can…….please do stop in and check it out.You won’t be disappointed. I second that. You won’t be disappointed with The Amboy Cottage Cafe. I grew up in Amboy and now live in another state. My first time eating at the Cottage Cafe, someone invited me to share her table, as the cafe was hopping busy. She said I *had* to try the raspberry bread pudding. Oh my, sooo good! 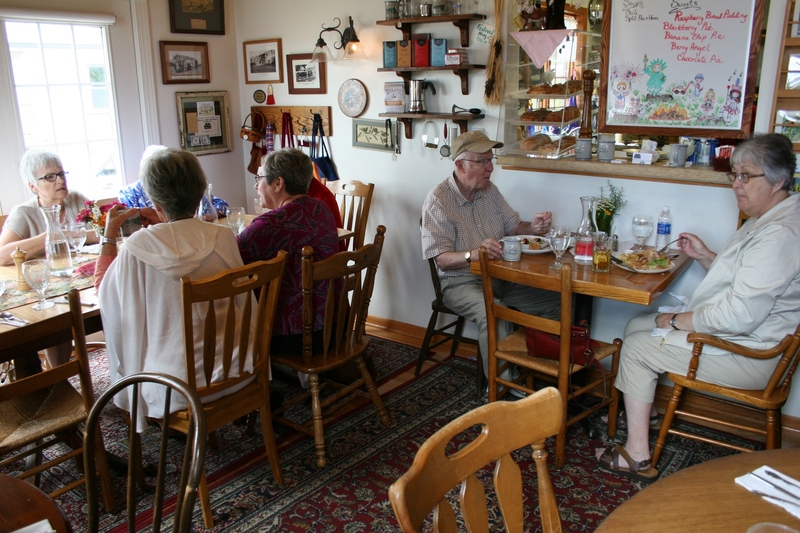 I bet that’s a frequent occurrence at The Amboy Cottage Cafe for strangers to sit together. The only table open when my husband and I arrived seated four. So when the next couple walked in the door, we welcomed them to join us, just as you were invited to share a table. Next time there, I fully intend to try the raspberry bread pudding. 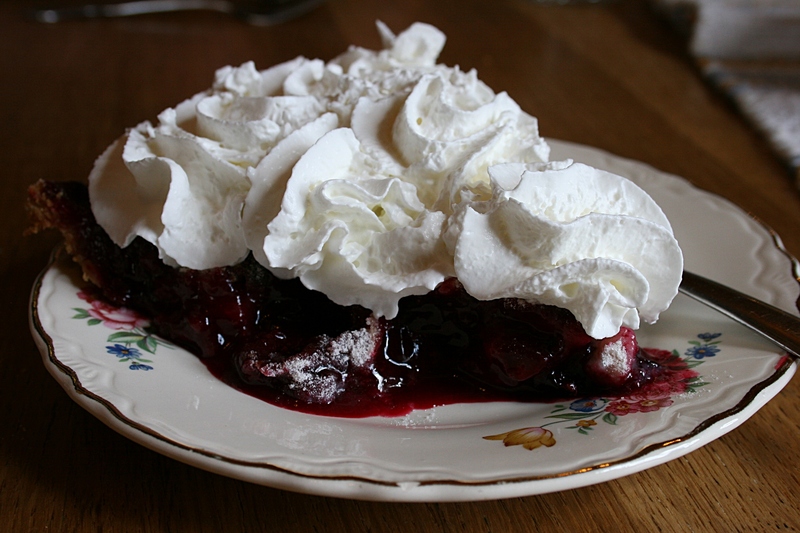 Next time you’re there, try the blackberry pie. Yummmmmmm. Thanks for stopping by from “another state” to celebrate your hometown with me. Their bread pudding is delicious!!!!!! I’ve been there a few times as I have family in the area. My great aunt is a regular and I believe she has her own coffee cup. My grandma loves taking people there when they visit her. It’s just such a neat little place!!!! Thanks for your personal recommendation of the bread pudding. Love that your great aunt has a coffee cup there and that your grandma takes guests to The Amboy Cottage Cafe. It’s an all around great place, in food, setting and people. I am with you. I really don’t like a menu that has the same old fried foods! I have been to the Rainbow Café in Pine Island several times. I really like that they use local foods. It really bothers me to get a green salad with hard tomatoes this time of year when we have so many fresh vegetables available. There is a great little restaurant in West Branch, Iowa. It is owned by 2 chefs and everything is homemade! It is a lot like the restaurant in Amboy. Coffee mugs and pieces of Carnival glassware on shelves. Small and quaint. I can’t remember the name, but it is right on the main street which is only a couple blocks long. Our daughter lives there so we have been there several times. That restaurant in West Branch sounds fabulous. 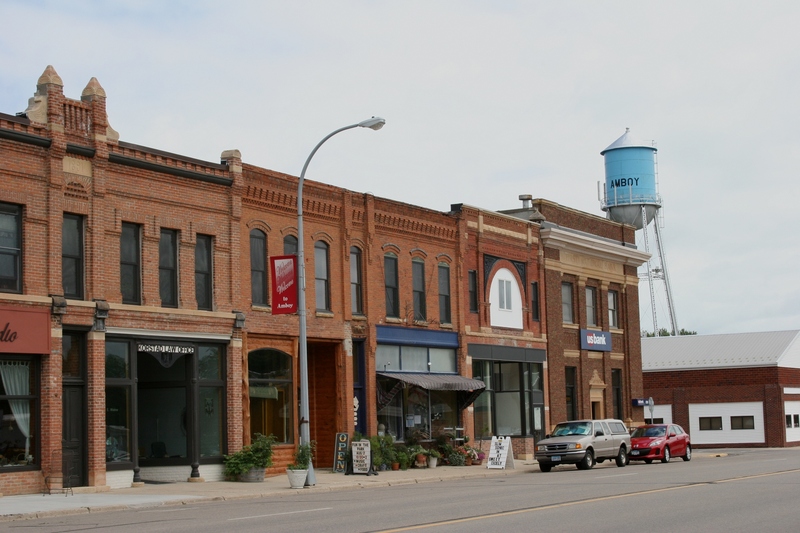 I had a terrific salad at The Depot here in Faribault several weeks ago. I can’t remember all of the ingredients, but it featured smoked salmon on a bed of greens and also included blue cheese. 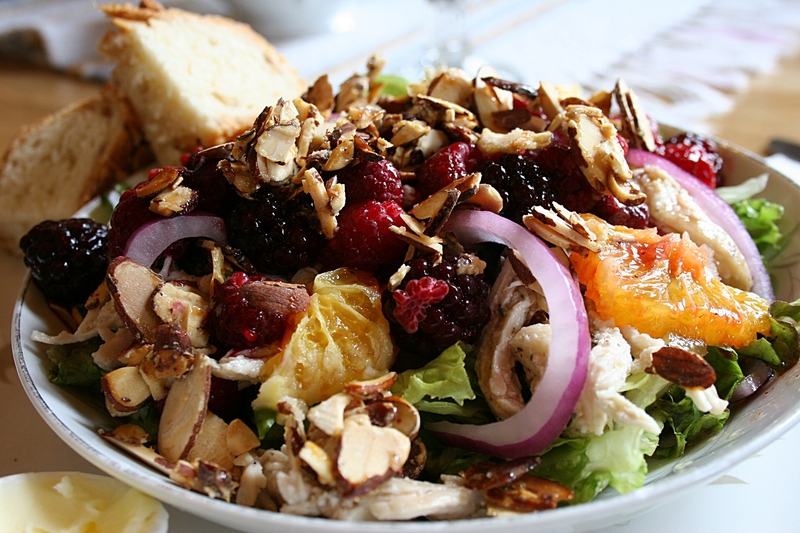 It was as good as the salad I ate at The Amboy Cottage Cafe.